Drs. 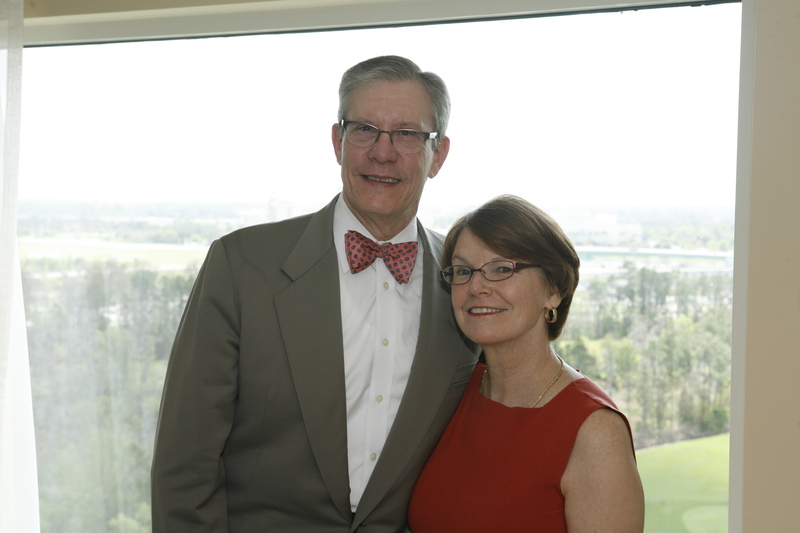 Daniel and Kathy Clarke-Person have made a historic lead gift to launch a professorship bearing their names. Drs. Daniel and Kathleen “Katchy” Clarke-Pearson are leading by example with a generous personal commitment to endow the Drs. Daniel and Kathleen Clarke-Pearson Distinguished Professorship to support the academic mission of the UNC Department of Obstetrics and Gynecology. Dan and Katchy speak with tenderness and humor towards each other, yet remain modest when discussing their noteworthy accomplishments. This engaging pair have always been true partners – supporting each other’s careers in obstetrics and gynecology and pediatrics, respectively, as they raised four children. Now, they are giving back to support the careers of the department’s future leaders. Dan attended Harvard College where he majored in biology and was a two-year football varsity athlete. He spent a year as a research technician at a Boston Veterans Affairs Hospital where he developed his personal research interest in the diagnosis and prevention of venous thromboembolic events (blood clots), which has continued as his research focus for the past four decades. He entered Case Western Reserve University School of Medicine at a time when OB-GYN specialty expertise was just being recognized and certified. He saw that there would be many opportunities to develop a career based in academics, education and research. When Dan graduated in 1975, Katchy, who was teaching elementary school, noted that there were 16 women in his graduating class, many more than in most medical schools. This observation, coupled with the role of medicine in her own family (her father was a doctor in private practice in Queens, New York), would eventually lead the mother of two to apply to medical school herself. After Dan’s graduation, the family moved to North Carolina where Dan began a residency in obstetrics and gynecology and a fellowship in gynecologic oncology at Duke University. Katchy taught at Frank Porter Graham Elementary School while taking premedical courses at UNC. Katchy received an acceptance letter from UNC’s School of Medicine three days after delivering Mary, their third child, and on the second birthday of their daughter Emily. It was July 8, and classes were to begin in just six weeks. Katchy’s adept problem-solving, a trait she shares with her husband, served her well in medical school as she worked with administrators and faculty to balance her academic and family obligations. She completed medical school in five years instead of the conventional four-year track. After her education and training, she became an accomplished pediatric physician in rural areas south of Chapel Hill, serving many who relied on Medicaid for their healthcare coverage. Meanwhile, Dan rose to tenured professor and director of the Division of Gynecologic Oncology at Duke. He developed his research in the prevention, treatment, and diagnosis of blood clots in women undergoing gynecologic surgery. Over the past 40 years, the clinical application of his research has saved the lives of countless women and has set the standard of care for all OB-GYN physicians. Throughout his tenure at Duke, he was the fellowship director for gynecologic oncology, and his commitment to train and mentor the next generation of gynecologic oncologists produced 16 of 18 fellows who accepted academic positions in university medical centers. In 2005, Dan joined the faculty at UNC’s School of Medicine as Robert A. Ross Distinguished Professor and Chair of the Department of Obstetrics and Gynecology, a position he still holds. Katchy’s legacy at UNC was still memorable in 2005 when Dan came to interview and one faculty member remarked, “Clarke-Pearson, she’s the one who broke the glass ceiling.” No one before her had requested a five-year medical school journey. “I have known Dan and Katchy for more than 10 years, and they truly wear their values on their sleeves,” said Kim Schneider, MPH, CMPE, Vice Chair for Administration at UNC OB-GYN and Director of Strategic Alignment for Women’s Services at UNC Hospitals. Dan and Katchy firmly believe providing and creating opportunities for discovery and research is critical to improve the health of women. To that end, they envision this professorship as a vehicle to provide faculty with resources not funded through traditional grants and sponsored research. In spring of 2017, the Drs. Clarke-Pearson were working together on a fundraising project for the physician who delivered their youngest two children. As they were raising funds, it became apparent to both of them that if they wanted to create the professorship they envisioned they should lead the way. They took the unprecedented approach of establishing the professorship themselves with a lead gift of $500,000. Katchy presumed the professorship would hold only Dan’s name, as she is a pediatrician and not an OB-GYN. But as with everything else in their life together, this professorship would be a partnership, holding both of their names. While they remain humble about their personal achievements, they understand that a premier OB-GYN department faces many challenges to fulfill its academic mission. They believe strongly that the UNC Department of OB-GYN needs their support to fulfill the academic missions in the years ahead. As Katchy said, “If there is something you really want, you will find a way to support our potential leaders.” The Clarke-Pearson endowed professorship will certainly aid in that endeavor. To support this professorship, contact Jodie Gisser, Director of Development – Women’s Health, at 919.843.9898 (o), 919.538.3171(c) or jodie_gisser@med.unc.edu.